FreeNAS is probably the most popular and most used Free NAS Operating System. Today, 15th March 2017, version 10 has been released, bringing many new exciting features. With this new update, FreeNAS changes face, name and is bound to change the rules of the game. Let’s take a look at the new features! If you already know what’s in for you, here’s the download. And here is the guide to install FreeNAS Corral in 5 easy steps! First and foremost, FreeNAS 10 is based on FreeBSD 11, this alone brings a plethora of improvements. However, with the final release, developers have decided to drop the version number (which will still be kept under the hood for engineering purposes) and instead go with a codename: say hello to FreeNAS Corral. This, the developers say, will help decouple the association between versions of FreeBSD and FreeNAS as it was in the past: FreeBSD 9 -> FreeNAS 9/9.1/9.2/9.3/9.10 . The most prominent change on the surface is the User Interface. With a revamped look, asynchronous tasks (thanks to WebSockets) and “entirely new” menus, the Web User Interface aims to provide users with the best possible experience. 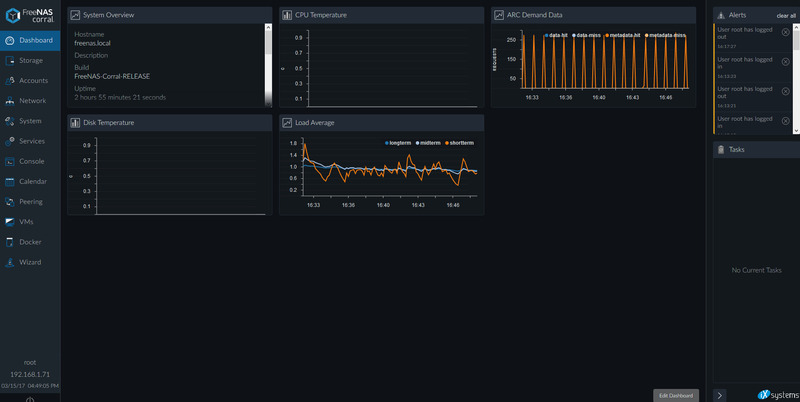 A new, customizable dashboard welcomes the user allowing to have a glance over the system’s usage and statistics. This new design is thought to unite the previous UI under the same concepts. The new interface also has a new middleware that enables multi-user, concurrent sessions. One confusing thing about Corral is the new use of the volume keyword. With Corral, volumes refer to ZFS Pools and that is counter-intuitive. Nevertheless, the process of creating poolsvolumes remains the same under the hood, not quite on the surface. 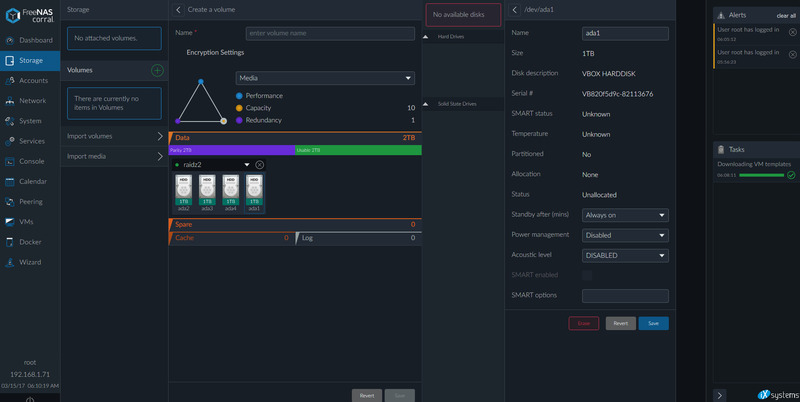 Thanks to the new UI, creating volumes is now easier and more user-friendly allowing the user to drag-n-drop the drives and select predefined settings like: performance, media or virtual machines. Virtual Machines through Bhyve: a sort of “KVM for BSD”. Containers through Docker: a relatively new (compared to BSD Jails) containerization method that has won the favours of many users/companies in the Linux and Windows world. Corral will also provide users with virtual machines templates (you can find them here) to allow a faster vm deployment. As for plugins, they are currently gone, but it is not to be excluded that they may return one day implemented on top of Docker. FreeIPA is the upstream project for Red Hat IDM: a popular solution for directory services. It provides functionalities similar to Active Directory for Windows. With this release, FreeNAS can now connect and use FreeIPA data. 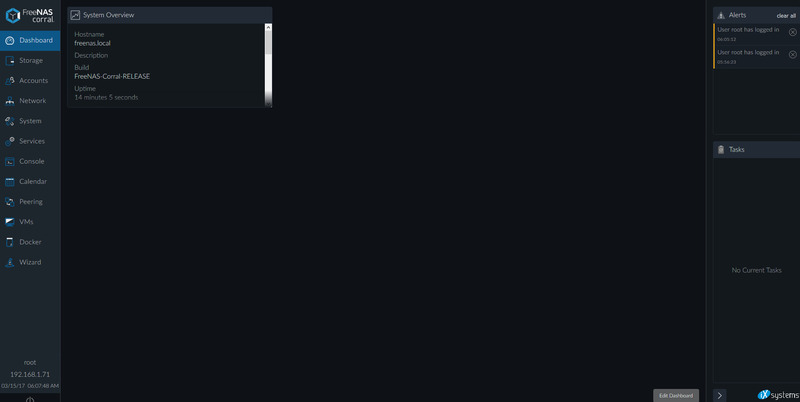 Another great change is the new CLI that now looks like the ones found in embedded devices. The new CLI allows a more streamlined, structured procedure and it is, in my opinion, a bit harsher on newbies. FreeNAS Corral is really a huge step forward and breaks the ties with the previous versions. This operating system, already one of the most popular among hobbyists and professional alike is once again revolutionising the NAS game. These new features are the most interesting, but they are by no mean a complete list. There are many other “small features” like the capability to offline a disk and so on that are not mentioned in the article. If you’re interested, you can take a look at the official bug tracker.